Progesterone is the main progestogenic steroid hormone secreted by the female reproductive system and is connected with the female menstrual cycle, pregnancy and embryo formation and development. 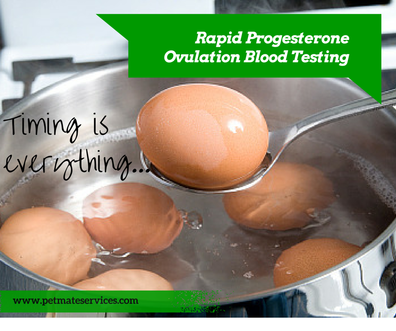 This means it's an ideal indicator for detecting ovulation through blood testing. Using laboratory equipment a blood sample from an animal in season can be measured for it's progesterone concentrations in blood serum. 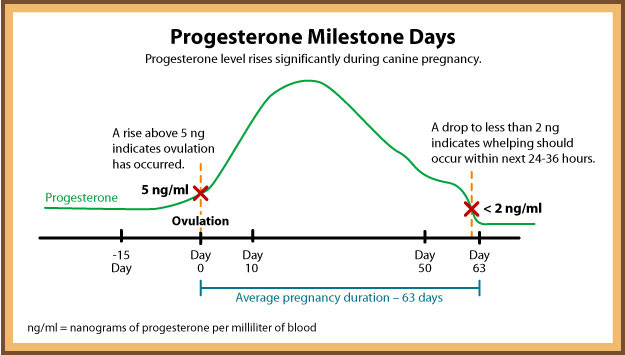 This quantitative result can then be used to indicate if your pet has ovulated and also predicate when she may ovulate. This ability to be able to interpret and forecast such information means more successful matings due to identifying the 'fertile period'. Results above 5ng/ml indicate ovulation (see graph). "Tests run during weekdays, weekends and Bank holidays!" 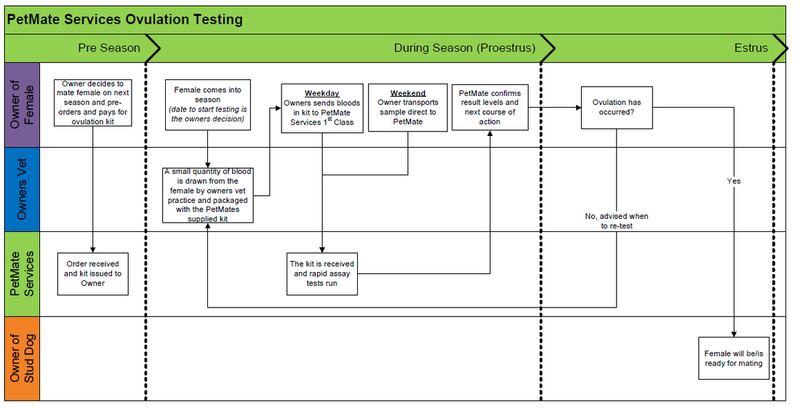 We can now offer a progestrone testing service that covers weekends and bank holidays by post, collection or drop off options available! You won't find this flexible service offered anywhere else in the UK! "Bloods can be posted, collected or dropped off!" Pre-order and pay for your postal Progesterone Kit from us before your female is in season. When her season has started from day 6 consider taking her to your vet for a blood draw. Owner to return the bloods in the PetMate kit provided. Bloods received at PetMate and processed. We thought you might that's why we've put together a document that might answer your question! Click below to view, if you still have a question please don't hesitate to contact us.